iBOSSinc BACK OFFICE INVESTOR HUB "iHUB"
The Regulation Crowdfunding database shows year to year and month to month growth in the number of new companies seeking money online. 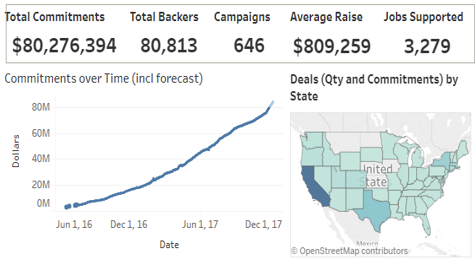 Dashboard - The numbers are in and businesses are getting funded. Just follow the process! Click here to see the full dashboard. Blog - Stay abreast of what's going on in the the venture asset class that includes startup & early stage businesses, focused on expanded capital solutions. Meetup - Virtually and at the quarterly Capital Conference. Staying abreast of trends in the crowdfunding market through case studies and industry reports. Your Lead Management System (LMS) is the center of your iHub, providing both process management tools and executive oversight. Customize how fans move through your funnel. Automate strategic and effectvie drip campaigns. Automate appointment setting for on & offline meetings. Opt for direct or assisted management of your platform. All-in-one social media management platform. When considering any form of "crowd" funding, it is imperative to build your crowd. This starts by attracting fans with a view toward eventually converting them to investors. Social media is an imperative when building a robust crowd. Your fan base will help to evangelize your investment opportunity, with the right information, circulated throughout different channels. What securities regualtions are you relying on for your capital offering? Are you marketing to accredited or non-accredited investors? Does the exemption you're relying on provide for general solicitation? Raising capital, whether to fund a new technological marvel or open a franchised restaurant, is one of the most challenging aspects of starting a business. From founders, to investors & employees, it's in everyones best interest to protect the entity by managing various risk through legal reviews, appropriate insurances & funding vehicles for executive coverages. The truth is, most new businesses will not succeed without a detailed and thorough business plan that recognizes where you are today, where you want to be tomorrow, what problems might arise, and how you are going to resolve them. The value of a business plan is that you are forced to think about your business critically, challenge your assumptions, and research when you’re not sure of your facts. A complete plan identifies and quantifies the capital that is likely to be required to reach break-even and beyond. It is absolutely essential when soliciting investors. Armed with the right tools to convey both the story and investment opportuntiy to investors, its time to prepare the investment offering documents - along with compliant collaterals to be used to garner their attention. Innovative fintech platforms bringing transparency, efficiency and compliance to crowd funded capital campaigns. Crowd-direct offerings require the ability for investors to easily, hiccup-free and in a single sitting - start & complete their investment 100% online. Everything you need to successfully, and in compliance, conduct offerings from Regulation Crowd Funding to Private Placements through Public Offerings. Seed Capital Takes Patience, Time and Tenacity - Make It Worth It! This is the "f&f round" - first funders (I know you thought I was going to say friends & family!). We understand that many entrepreneurs do no have friends & family with available cash to lend or invest. The iHub has aggregagted a few processes that when executed can help startups get to the first $150,000. When fully implemented, companies will gain experience with both debt & equity while setting themselves up to raise a significant next round. Whether seeking traditional financing, angel or crowd investor(s) theses seed funds should be shared between operations and the expense of a $1,000,000+ capital raise. You cannot be successful at raising capital with poor financial management, which is a deterrent for investors. QuckBooks provides many options, with their online version being most cost effective. Knowing your numbers is important for both healthy growth & reporting to shareholders. QuickBooks Online integrates with iHub applications, providing analytics to optimize operations. Know your numbers! Understanding your business performance metrics in the now is what helps you to make intelligence driven decisions for the future. Let your numbers tell you when you are on target to reach your goals, or not. Know when and where to make adjustments to activities that bear fruit, or not. Stop operating from the gut when you can have real data for measurable results. The Securitiees and Exchange Commission - EDGAR, the Electronic Data Gathering, Analysis, and Retrieval system, performs automated collection, validation, indexing, acceptance, and forwarding of submissions by companies and others who are required by law to file forms with the U.S. Securities and Exchange Commission. What capital is the right capital for you. The lifecycle of a business requires capital for every stage of growth, though the type of capital changes, In the early stages its most difficult to attract any capital - more less the right capital. Assess which is right capital vehicle for you today. Your budget 1st requires an understanding of how much you need and how many prospects will be required for your funnel. Use this calculator to assess the process beginning with the formula: $needed / $unitsold = #investors required. Your answer will drive your process. North American Securities Administration Association - a directory of state securities laws, regulations and contact information for each state, offering resources for the securities industry professionals, capital formation resources for small businesses and entrepreneurs. Everything you need to know about raising money and financing through crowdfunding, angel investors, seed rounds, term sheets, or venture capital. And, when a securities attorney is required - order one! Be your own stock transfer agent. Issue electronic shares, options and notes for easy management of your shareholder records. The necessary tools to do transfer agent services without the need for a full service transfer agent. Run your business more efficiently and effectively while keeping your finances simple and secure. Experience the confidence and control of Small Business Online Banking. Payroll services, remote online deposits, account management, tax services and more. The Report on Startup Firms offers detailed intelligence on startups’ financing needs and challenges, asking questions about capital requests, borrowing qualifications, applications and success levels.